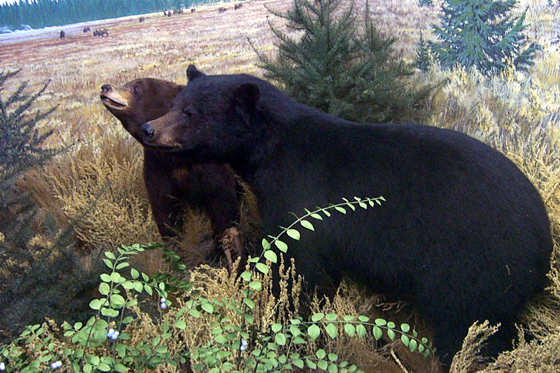 The American black bear can be found in Alaska and in Canada. Black bears are omnivores. Their diet consists of seeds, berries, fruits, roots and plants. They also feed on insects (especially ants), deer, elks, carcasses and, if available, salmon and eggs. The American black bear is a medium-sized bear: it weighs between 60 to 230 kg and can measure from 125 to 190 cm in length. This bear may seem smaller due to its relatively short and stocky legs; however, when it stands on its hind legs, its size is evident.